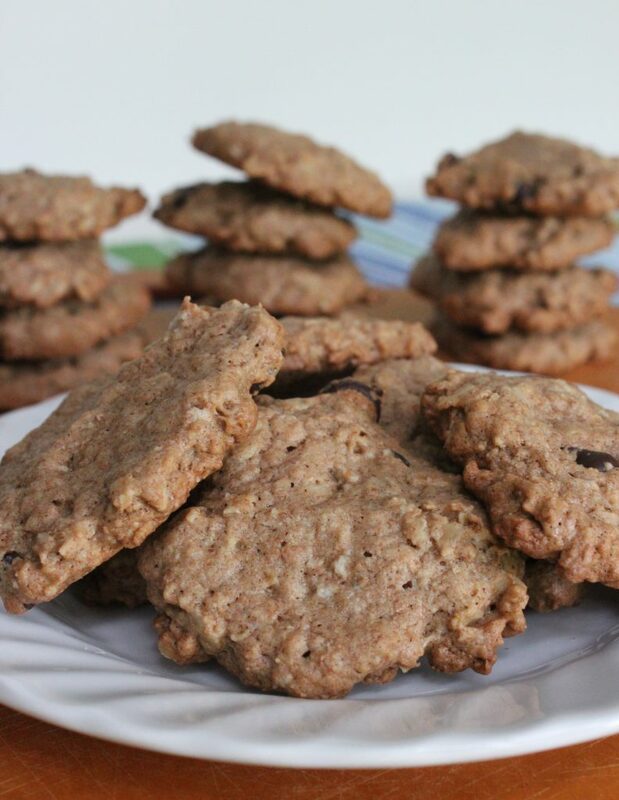 This oatmeal cookies are made with whole grains. Teaching your kids how to cook is a life skill. Get then excited to join you in the kitchen and make these heart healthy whole grain cookies together. Depending on their age they can find ingredients, measure, stir, or spoon out cookie dough. Preheat your oven to 375°F/190°C. Line a cookie sheet with parchment paper. In a medium bowl cream the non-hydrogenated margarine. Beat in both sugars till fluffy. Add the egg, water and vanilla, beat till creamy. Add the whole wheat flour, rolled oats, baking soda and cinnamon. Mix until combined. Stir in the raisins or chocolate chips. Drop by rounded teaspoonful onto the cookie sheet or try a mini scoop. See picture below. Gently press down with your fingers to slightly flatten the cookie. Bake for 12-14 minutes. Let cool slightly on the cookie sheet, then remove from the pan and let them finish cooling on a wire rack, if you can wait that long. Store in an airtight container for up to 1 week or freeze for up to 2 months. Makes – 50 cookies, if and only if, you use a teaspoonful of batter per cookie. 2 cookies contain: 115 Calories, 4.5 g Total Fat, 0 g Sat Fat, 0 g Trans Fat, 30 mg Sodium, 18 g Carbs, 1 g Fibre, 2 g Protein. Whole grains are better for your heart and your GI tract than refined grains. By adding natural wheat germ into this cookie recipe the whole wheat flour becomes a whole grain. I would like to start using coconut oil in my cooking and baking. Do I use the same amount the recipe calls for in regular oil? If I could use butter. What other changes? You may have to alter baking time, watch for burning. This is fabulous! My 4 year old loves both oatmeal choc chip and raisin – depending on her mood. Love that it isn’t too sweet. My little one is not a fan of overly sweet 🙂 Love you and your recipes, Mairlyn! Aw, that made me smile, really big! Thanks for all of your support and your very kind words! I love your recipe for these oatmeal chocolate chip cookies! They are so good! 🙂 I was wondering if you have a recipe adaptation that could make these into chocolate oatmeal peanut butter chip cookies as well. Thanks for any help! ts a great idea! I’ll have to work on it. Do you have sugar free whole wheat cake recipe? Sorry, I don’t. Sugar helps with tenderizing, so in a cake its all about the science…. Sorry I couldn’t help you out.